Chinese violet, photographed at Seacrest Scrub Natural Area, Boynton Beach, Palm Beach County, in September 2013. Generally speaking, invasive plants become invasive plants because they offer something we humans find irresistable — potential as a food crop or as a ground cover, to name two possibilities. In the case of Chinese violet, it's beauty. The plant, known scientifically as Asystasia gangetica, puts out tons of large violet-blue and white trumpet flowers. Unfortunately, it's also a pest, rapidly growing where it's not supposed to grow at the expense of native species. The plant's native range includes tropical Africa, India and Southeast Asia. Oddly enough, despite the name, Chinese violet is not native to China but rather an introduced plant there, according to the Invasive Species Copendium. Chinese violet is now found on five continents, including North America, South America and Australia as well as much of the Pacific. So far, Florida and Hawaii are the only states in the union where it grows in the wild. 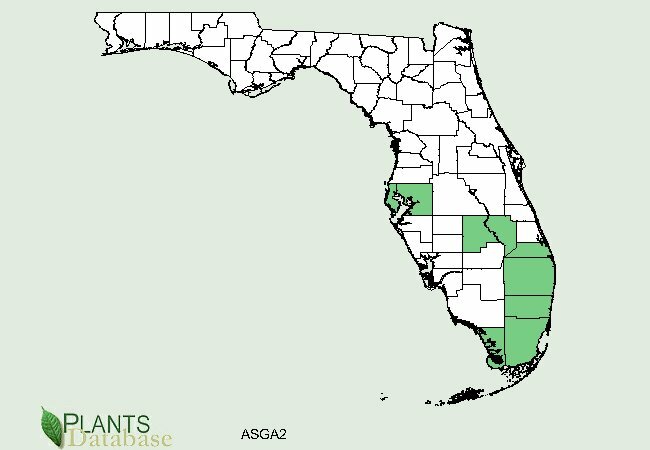 It's mostly found in the Atlantic coastal counties, from Martin southward to the Keys. It's found throughout much of the Caribbean and Central America. It's considered an invasive in Puerto Rico, the U.S. Virgin Islands, British Virgin Islands and Cuba. 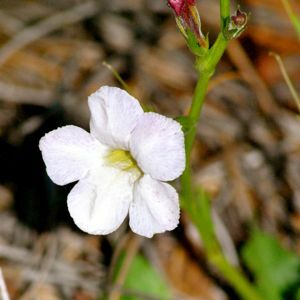 Florida considers it both a noxious weed and category II invasive, meaning it's spreading in the wild and has the potential to damage ecosystems but has yet to do so. According to the Copendium, Chinese violet made its way to the Caribbean some time around 1898, imported as an ornamental. The Univeristy of Florida's Institute for Aquatic and Invasive plants dates its arrival in the Sunshine State to some time about 1930. It's been listed as an invasive and noxious weed here since 1999. Chinese violet can be an erect plant or clambering, about three feet tall at its maxium. It has a weak, hairy stem, with nodes that will root when they touch the ground. Leaves are oval in shape, simple and opposite along the stem. 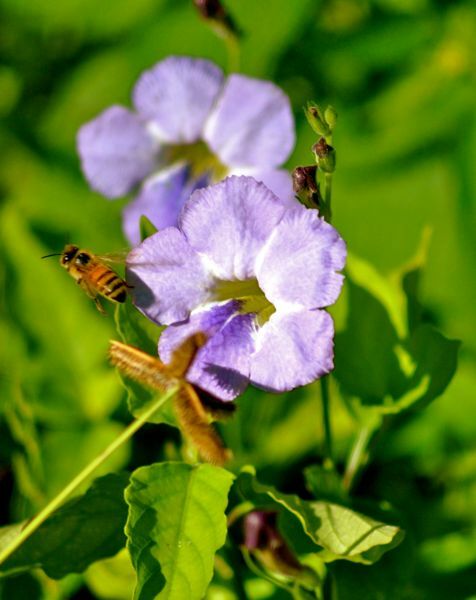 The flowers are trumpet shaped and vary in color from blueish purple, to yellow to white. The fruit is a club-shaped pod that explodes when it ripens to disperse its seeds. What makes Chinese violet a problem in places where it's not native is its ability to grow and reproduce rapidly. The plant can flower and produce seeds and fruit within 45 days after germination. It can form dense patches that crowds out natives. What's worse, it also reproduces from pieces broken off the main plant, meaning attempts to eliminate it by pulling it can actually spread it if not done carefully. And it also spreads via rhizomes, or underground roots, making it a triple threat. Australia has put the Chinese violet on its National Environmental Alert List because of the dense mats the plant can form that block out native species. But Chinese violet is not all bad, of course. In Africa, it plays an important environmental role, providing food for bees and butterflies; in some countries, it's eaten as a vegetable. Other names include Ganges primrose, Philippine violet and coromandel, creeping foxglove and asystasia. It is a member of Acanthaceae, a family of mostly tropical plants that includes wild petunias. 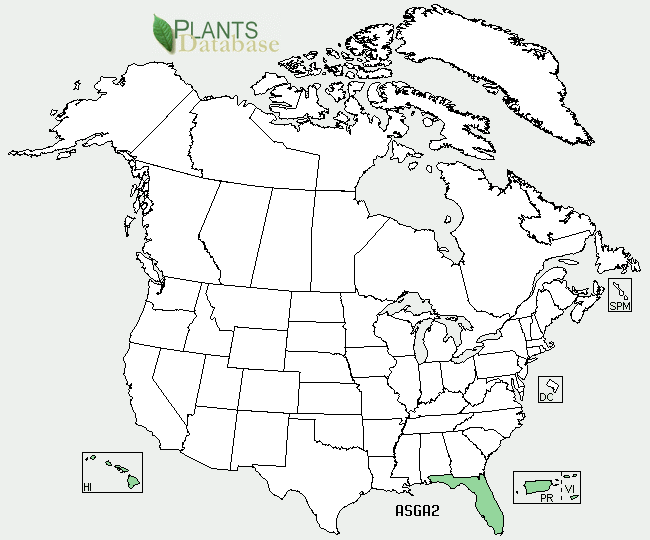 United States Department of Agriculture (USDA) distribution maps for Chinese violet.